ACM SIGGRAPH will award its 2003 Significant New Researcher Award to Mathieu Desbrun for his original contributions to deformable models and animation. Desbrun has also contributed to discrete differential geometry and mesh processing and compression. He has demonstrated a strong grasp of the mathematics of graphics problems as well as a sound understanding of user needs. The Significant New Researcher Award is given annually to a researcher who has made a recent significant contribution to the field of computer graphics and is new to the field. Desbrun, an assistant professor at the University of Southern California, receives his award at SIGGRAPH 2003, 27-31 July 2003, at the San Diego Convention Center in San Diego, CA. In 1997, Desbrun won recognition as Best PhD Dissertation for his work on “Modeling and Animating Highly Deformable Substances in Computer Graphics” at the National Polytechnic Institute of Grenoble in France. The thesis made original contributions to animation using implicit surfaces. 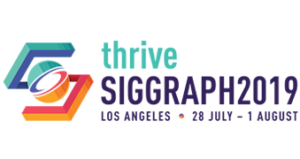 Desbrun’s widely cited SIGGRAPH 99 paper on implicit fairing of irregular triangle meshes developed methods using discrete differential geometry operators to remove undesirable noise from a mesh while retaining desirable features. He will present an extension of this method at the 2003 SIGGRAPH Conference in San Diego. Desbrun received an MSC in Computer Graphics and Vision at the University of Grenoble, and an ME in Computer Science from the National Engineering School of Computer Science and Applied Mathematics. He joined the iMAGIS lab in Grenoble, and completed his PhD under the supervision of Marie-Paule Cani. After a postdoctoral fellowship at California Polytechnic Institute, where he collaborated with Peter Schröder at the Multi-Res Modeling Group, he joined USC. Schröder is the winner of the 2003 Computer Graphics Achievement Award from ACM SIGGRAPH, to be presented at SIGGRAPH 2003.